Poised atop scenic, historic Turner’s Gap, the Old South Mountain Inn offers its visitors hospitality, fine eating, and convenience to the tourist sites of Antietam Battlefield, Washington Monument State Park, Harpers Ferry and Gambrill State Park. Founded as early as 1732, the inn has seen history. In 1755 it is probable that General Edward Braddock, accompanied by the young Lt. George Washington, marched his army past on the way to his fatal encounter with the French and Indians near Fort Duquesne. By the late 1700ís pioneers had begun to roll steadily through Turner’s Gap on the National Trail to settle the land to the west. 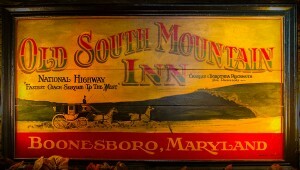 The South Mountain Inn uniquely served as a wagon stand as well as a stagecoach stop for the heavy traffic passing on the National Road after it was surfaced in the 1820ís. In the years that followed, the inn was visited by many Washington leaders, including Daniel Webster and Henry Clay, and several Presidents. For Clay and Webster particularly, it was a favorite resting spot. Clay was often called the father of the National Road; the road itself was sometimes termed the Henry Clay Road. 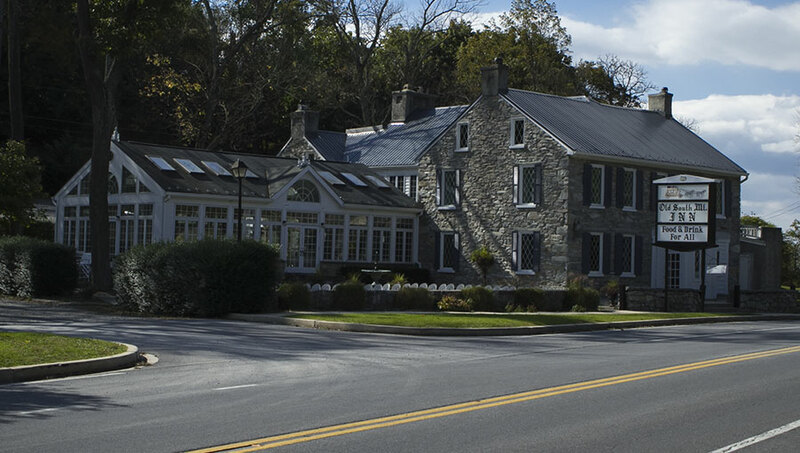 During the Civil War period, South Mountain Inn was a part of two pivotal events, the John Brown Raid on Harpers Ferry, and the Antietam Campaign. In 1859 the inn was captured and held overnight as an outpost and probable staging point by Brown’s followers. Three years later it was the headquarters of Confederate Gen. D.H. Hill during the Battle of South Mountain, prelim to the Battle of Antietam. Following the Civil War, the business of the tavern declined, due in large part to the reduced importance of the National Road as the railroads spread across the mountains. The property was sold in 1876 to Madeline Vinton Dahlgren, wealthy widow of Admiral John A. Dahlgren. The South Mountain House became a private residence, improved with attention to the antiquity of the building. Mrs. Dahlgren also built the stone Dahlgren Chapel, which is open to the public on summer weekends. The house once again became a tavern in 1925 and continued as a local pub until its purchase in 1971 by Charles and Dorothea Reichmuth, who offered visitors a setting of historical authenticity, gracious hospitality, and good eating. In 1981, Russell and Judy Schwartz purchased the Inn from The Reichmuths and offered American fine dining with an elegant Colonial atmosphere. Then in 2001, the Inn was purchased by the Executive Chef and his wife, Chad and Lisa Dorsey, who are the present owners of the Inn. For over 250 years The Old South Mountain Inn has remained a remarkable mainstay in an ever changing world.